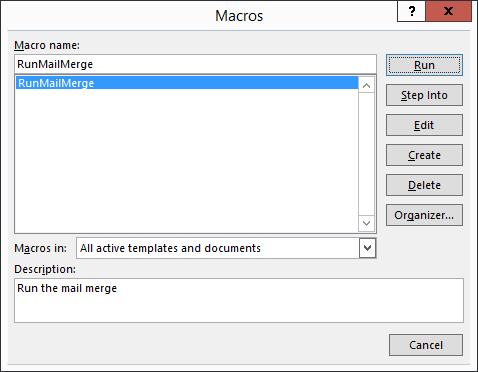 Open an exisiting mail merge document or create a new one. 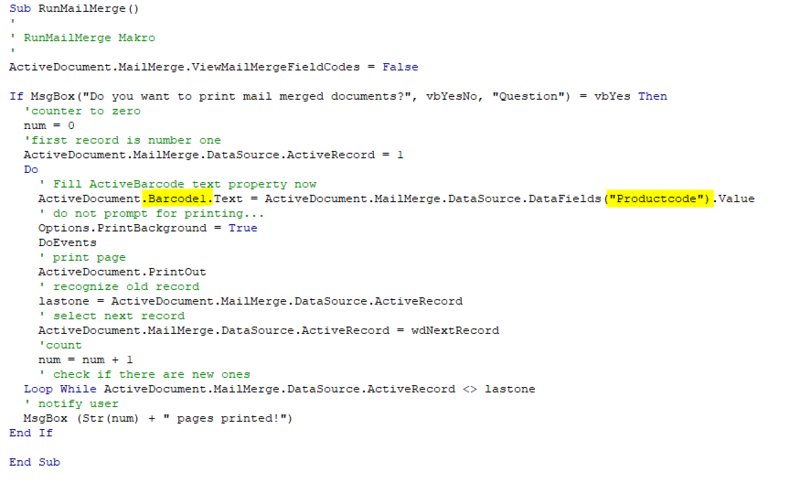 Add the Barcode Object to your mail merge document. Insert the Barcode object into your mail merge document. Place it where you want it in the document and set the Properties of the object, such as barcode type and size. This will look like the following screenshot, for example. Note the name of the barcode object (highlighted here in yellow). Usually this will be Barcode1. The result looks like this. In the screenshot, you can also see where the macro is inserted. If the name of your barcode object is not Barcode1, change it in the macro (left yellow mark in the screenshot). Now you change the field name from your data source, which is to be used for the barcode. In this example, "Productcode" is used (right yellow mark in the screenshot). Change the name within the quotation marks. Save the document and start the macro for a test print. Tip: Do start the test printout with very few data sets, so that there are not too much misprints in the event of an error or mistake. If you have placed the macro not in the document itself but, for example, in Normal. dot, the document must not be in design mode when you execute the macro. This will cause an error. Therefore, switch off the design mode before executing the macro. If you need support or an individual solution for customization to your needs, we can offer support. A Word document with a barcode control is used for serial printing. The barcode is changed during the serial printing accordingly.